Humans have trillions of bacteria that live within and on us. They perform important functions to keep us healthy, such as metabolising food and medicine, and fighting infections. The gastrointestinal tract harbours the majority of these bacteria, which we refer to as bacterial gut microbiota. Scientists use genetic analyses of these bacteria to investigate the gut microbiome (genomes of the bacterial microbiota). The gut microbiota is extremely complex, and scientists are constantly uncovering new functions of these microbes and their association with disease. 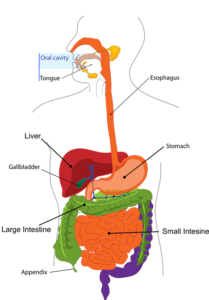 In recent years, scientists have discovered that the gut microbiota plays a key role in brain functioning and behaviour, and even has its own neural network, called the enteric nervous system (ENS), a complex system of millions of nerves in the lining of the gut. The ENS is also been termed our second brain, due to its similarities with the central nervous system (CNS). A complex, bidirectional interaction exists between the gut, the gut microbiota and the CNS, termed the gut-microbiota- brain axis. The gut microbiota has the ability to influence CNS functioning and behaviour through several mechanisms, including the ENS and through the production of neurotransmitters, immune-regulating molecules and bacterial toxins. Stress and emotions can also influence the gut microbiota composition. For example, stress hormones can affect the bacterial composition of the gut and can compromise the integrity of the intestinal lining. 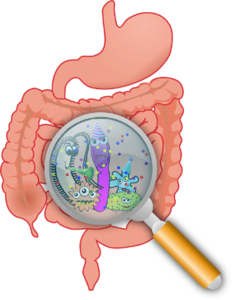 Damage to the gut lining can result in bacteria and toxins crossing into the blood circulation, which can ultimately promote systemic inflammation, which has been shown to play a role in several psychiatric disorders. The majority of gut microbiome studies in the field of neuroscience have been conducted in animal models and such studies in humans generally have small sample sizes. Therefore, more large-scale studies are required to investigating the intricate link between the gut microbiome and brain.